Mohammad Saif Uddin is a PhD Fellow at the Institute of Water and Flood Management, Bangladesh University of Engineering and Technology (BUET). 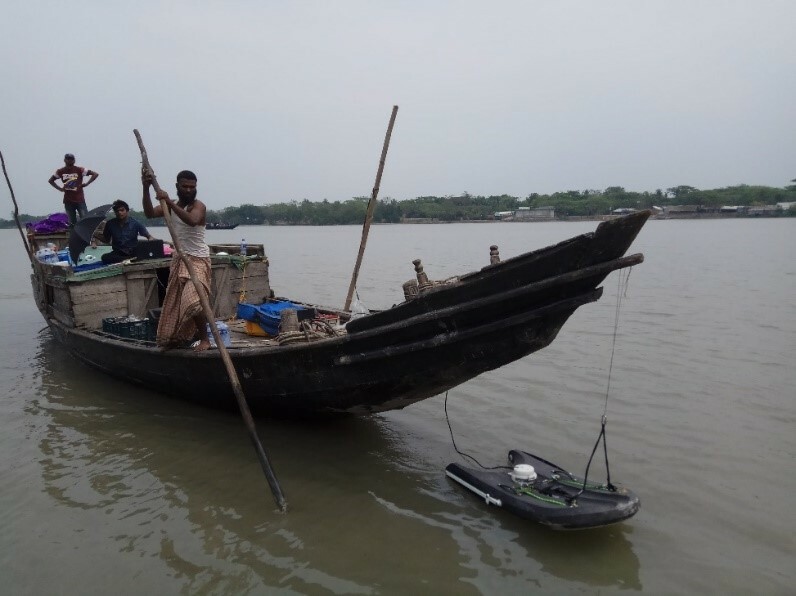 His research contributes to the REACH ‘Coastal Water Security’ Observatory, in Khulna district, which aims to understand the links between coastal water security and poverty, and ultimately identify sequences of interventions for improving water security for the coastal poor. 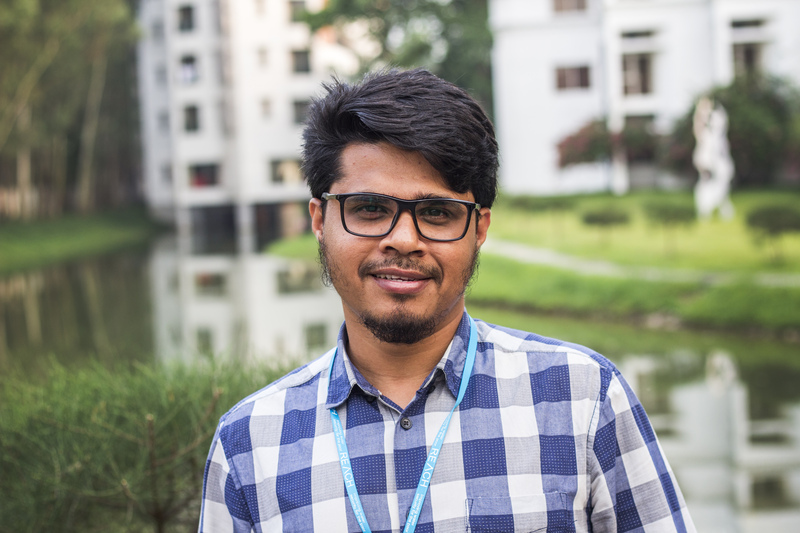 Saif studies some of the physical aspects of water security in Khulna district, in particular looking at river sedimentation, identified as a key driver of water-logging which can significantly affect agricultural production. His research also examines potential interventions to address this issue and to support water secure development in coastal Bangladesh. Saif completed a BSc in Water Resources Engineering from BUET in 2004, and an MSc in Municipal Water and Infrastructure from UNESCO-IHE, Delft in the Netherlands in 2011. He also worked as Assistant Engineer at the Bangladesh Water Development Board (BWDB) in 2005, where he was then promoted as Executive Engineer in 2016. During his employment at the BWDB, he was involved with the design and planning of various hydraulic interventions, including different polder rehabilitation projects. In this short interview, he shares with us key insights from his research. 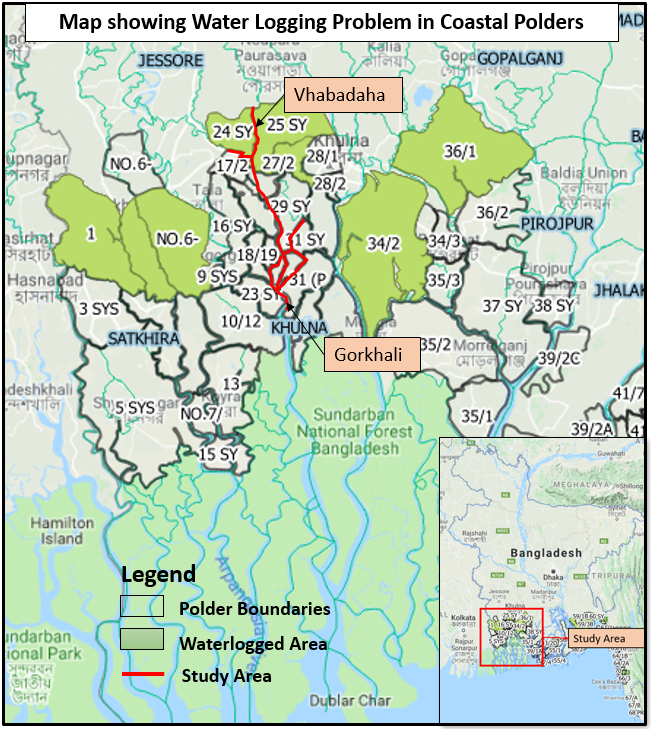 Water insecurity in coastal Bangladesh is increasing due to population growth, rapid environmental change, and chronic water-related hazards. The REACH programme, led in Bangladesh by the Bangladesh University of Engineering and Technology (BUET), is conducting research in Khulna district to improve our understanding of how coastal water risks affect poverty and to determine the best interventions for improving water security and bringing people out of the water-climate-poverty trap. Water-logging, which refers to the presence of stagnant water above the ground, is a particularly pressing concern in the coastal zone of Bangladesh and its severity is increasing every year, receiving less attention than many other water insecurity issues. Water-logging can restrict key livelihood activities, significantly reducing agricultural yields and affecting drinking water quality. The situation is much worse in the southwest region of Bangladesh where the REACH Khulna Observatory is located. The first objective of my research is to understand the physical process responsible for river siltation which has been identified as the main cause of water-logging. Second, it is to evaluate different hydraulic interventions that can help minimise the river sedimentation. Finally, I will analyse different combinations of interventions to minimise the risk of river siltation in my study area. Why is your research relevant and important in the Bangladeshi context? Polder systems were constructed in the 1960s in Bangladesh to protect the coast from tidal flooding, and reduce salinity intrusion. These interventions have led to some positive impacts, such as an increase in agricultural production. However, issues relating to water-logging, which is detrimental to agriculture, started to appear in the late 70’s, becoming prominent in the mid-80’s and formally identified as a disaster in the 90’s. Polders restrict silt deposition in the low-lying lands (beels), which lead to large scale river bed siltation. Moreover, a significant reduction in fresh water flows from the upper region limits the flushing of sediments. This continuous siltation process, taking place over the years, has contributed to raising the river bed, resulting in large scale water-logging problems inside the polders, particularly in the south west region of Bangladesh, affecting both agriculture and drinking water. Bangladesh Water Development Board (BWDB) aims to address the issue by implementing several projects with different hydraulic structure along with changing different policy and management issues in the water-logged area. BWDB successfully implemented several system level-interventions (structures constructed in the rivers to control river flow) with some effective tidal river management (TRM) operations in last 20 years, primarily focusing on areas where the issue is the most severe. Yet, despite the measures, the water-logging issue continues to increase every year. It is now necessary to develop basin-wide planning (considering all rivers connecting the problematic area and the sea) by analysing the performance of different system-level interventions for managing water-logging. My research aims to evaluate different hydraulic interventions, for which understanding the tidal dynamics is a key priority. My research will also contribute to basin-wide planning, by analysing different combinations of interventions as a sustainable solution to water-logging. 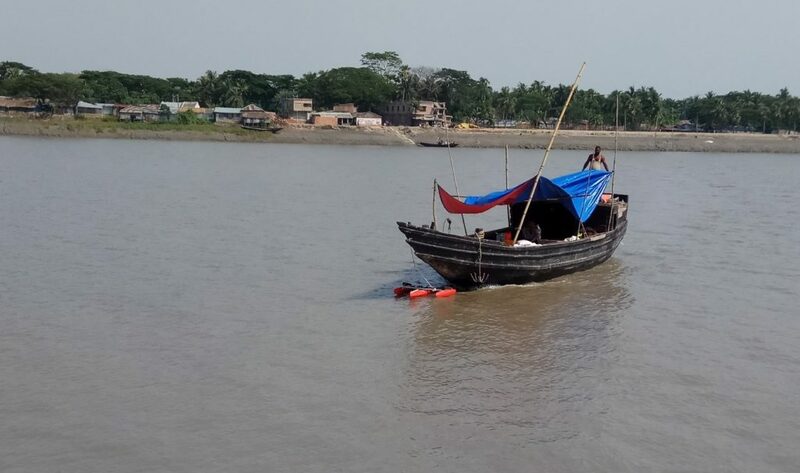 Tidal dynamics in shallow estuaries are complex, particularly in coastal Bangladesh due to the considerable level of unplanned human interventions. The first objective of my research is to understand the spatial and temporal variation of tidal hydrodynamics and sediment concentration. The most critical area for sedimentation is Vhabadaha (Figure-1) which has been selected as my study area as part of the REACH study in the Khulna Observatory. I have measured continuous tidal flow, water level, and sediment samples at three different depth and four different boundary points in April which represents the pre-monsoon scenarios of coastal dynamics. My results indicate a very critical hydrodynamic condition at Vhabadaha area, where the tidal range (the difference in water levels between high tide and low tide) is very small in comparison with the downstream point Gorkhali. 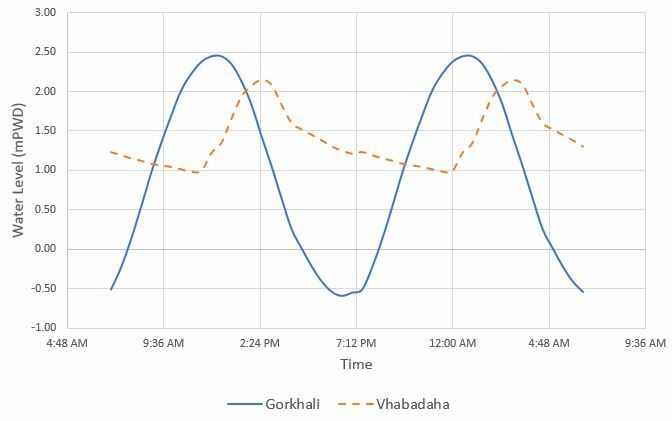 In Vhabadaha, the duration of the flood tide (when water is entering the river from the sea) is 3.5 hours and the Ebb tide (when water is going back to sea) is 9 hours, whereas the duration of the flood and Ebb tide is almost same in the Gorkhali point. This means that in Vhabadaha, tidal water is entering the river within a shorter period of time and stays longer before it flows back downstream. The daily average sediment concentration at Vhabadaha point is much higher (1941 mg/l) in comparison with the sediment concentration at Gorkhali point (287 mg/l). Vhabadaha is receiving water with a huge sediment load within a short period of time and the water stays for a longer period in the river before it goes back to the sea. As the water with high sediment concentration stays longer in the river, sediment particles have more time to settle in the river bed. In order to minimise river siltation, BWDB implemented several system-level interventions in the coastal region of Bangladesh. It has been found that for some of these interventions, the surrounding morphological conditions can impact their functionality. However, up until now, no mechanism has been developed to evaluate those impacts in coastal Bangladesh. My research is contributing to developing a conceptual framework to evaluate the functionality of different interventions in the river system, taking into account the location, the condition of river morphology, the sediment concentration, and water velocity, which will be key factors for engineers and policy makers involved in decision making to improve water security. Another exciting focus of my research is basin-wide planning for solving the water-logging problem. Present initiatives for managing water-logging issues often focus on the problematic area without addressing the source of the problem. As a consequence, water-logging continues to worsen. My research contributes to basin-wide planning by seeking to understand the drivers of water-logging and siltation issues, and the different sequences of interventions that can be developed taking into account financial considerations.